There's something to suit every taste, the tempting "Tortina Mini Original" and "Tortina Mini Noir Orange", the mouth-watering Patisserie range "Coconut", "Creme Noisette", "Cappuccino" and "Fondente Dark Noir", the delectable Classic Minis "Napolitaner" and "Cremkakao" right through to the irresistible Classic Minis "Chocolat", covered in milk chocolate or premium-quality extra dark chocolate. A triumph unmatched, with crispy wafers and the finest creams. The Best of Loacker is the ideal birthday present; a thoughtful gift for an anniversary; a recognition of a job well done for a company colleague; a new way to bring cheer and goodness into the home or to a picnic or to a party with friends! 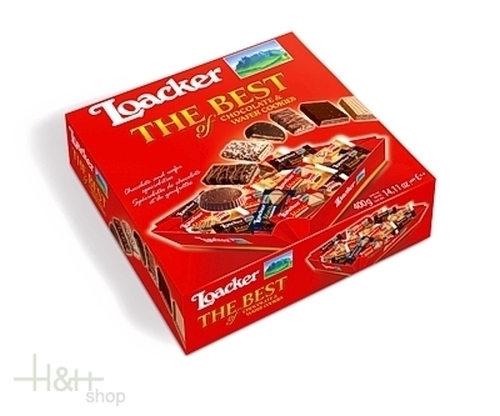 With The Best Of Loacker, office breaks, coffee breaks, or any time at home or outside become moments of pleasure. It's the perfect way to try the many Loacker tastes and to discover your favourite but it's also a rich source of goodness to hand out at Halloween or in an advent calendar. With 10 individually wrapped specialities, in an original and surprising pack, Best Of Loacker makes any occasion a special occasion!